Hing, also known Hingu and Heeng in Hindi, is an Indian spice used for flavoring the food and in herbal medicines for the treatment of digestive and mental ailment. However, flavoring food is not the main concern of hing spice. The main concern using it in the food is to prevent digestive ailment such as gas, flatulence, bloating and abdominal distension. What is Hing or Heeng? 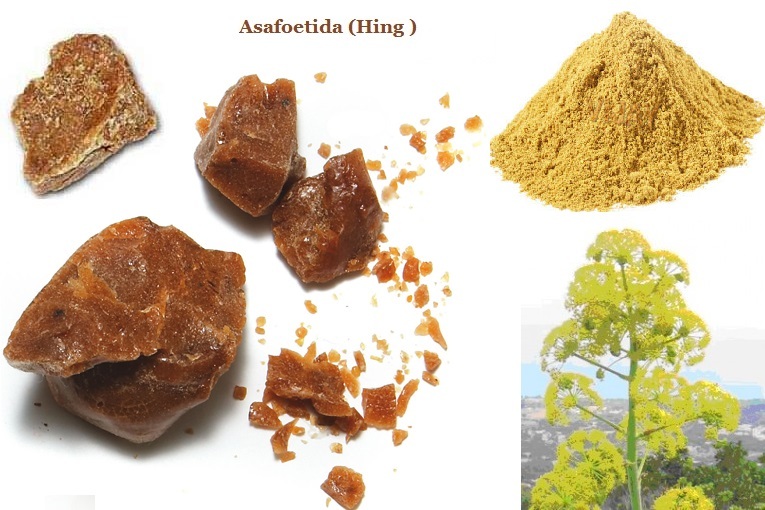 Hing is a resin obtained from the Ferula Assa Foetida plant’s roots by making small cuts. The juice comes out from the roots, which solidifies and converts into Hing resin (Hingu). Taste & Smell: It has bitter taste and unpleasant smell. FERULIC ACID has Anti-cancer, Anti-inflammatory, Anti-mutagenic, antineoplastic, Anti-tumor, Antiviral, Anti-bacterial, Anti-spasmodic, Hepato-protective, Antioxidant properties. Hing has following healing properties. Hing is helpful in following health conditions. The health benefits of Hing (Heeng) are attributed to its digestive, carminative, emmenagogue, and analgesic actions. It benefits for improving appetite, releasing gas, and promoting digestion. Hing powder has a great medicinal value in ayurveda and traditional herbal medicines. In traditional medicines, it is used for digestive ailment, mental disorders, heart diseases, and respiratory disorders. It is commonly used in diseases listed in therapeutic indication heading above. In this section, we will discuss about the main uses and benefits of Hing. Hing is used with jaggery in this disease. It reduces symptoms of conversion disorder including impaired coordination or imbalance, hysterical aphonia, convulsions, tremor, fainting etc. In this case, the dosage can vary from 10 mg to 125 mg of hing with 1/2 tsp. of jaggery. In sciatica, ghee fried hing is used. It reduces numbness, sciatica nerve pain and stiffness. Ayurvedic doctors recommend using 125 mg hing with 250 mg Pushkaramool (Inula racemosa) powder with Nirgundi Decoction for getting rid of sciatic nerve pain and numbness of the legs. Hing reduces cholesterol levels in the blood. It can decrease the cholesterol absorption in the gastrointestinal tract and reduces blood cholesterol by improving cholesterol metabolism in the body. It can prevent inflammation in the blood vessels, which is the primary cause of developing atherosclerosis and deposition of cholesterol plaque in the blood vessels. However, it is contradictory fact that it works in high blood pressure or low blood pressure. Research studies indicate that it can lower the blood pressure, whereas in traditional medicines it is used in case of hypotension. Some studies also suggested that it could increase blood pressure. Ayurveda has answer for this contradictory fact. According to ayurveda, it only works in VATA and KAPHA disorders. High blood pressure with high cholesterol is believed to be a KAPHA & VATA nature. It would only work when you have raised cholesterol levels. It helps reducing cholesterol and widens the lumen of blood vessels, which helps in easy flow of blood. Thus, blood pressure is reduced. In second case, patient with low blood pressure can also get benefits due to its hot potency. It also has cardiac stimulant property and thus normalizes the blood pressure. Hot potency is also required to reducing the cholesterol levels because hot potency of hing also improves metabolism of cholesterol in the body. The main effects of Hingu are on digestive health. It improves digestion, reduces flatulence and helps in irritable bowel syndrome. Adding Hing to oil while cooking unlocks its medicinal property and one such property is its ‘hypotensive nature’. Individuals who have high blood pressure must add Hing to their food preparations. Hing helps the arteries and blood vessels to relax, which help the blood to flow smoothly all throughout the body. This reduces the pressure of the blood against the inner walls of the arteries and prevents injury to the arteries and blood vessels. Coumarin, a special compound present in Hing improves the blood flow throughout the body without raising your blood pressure beyond normal limits. Hing powder is digestive stimulant. Its action is on digestive juices. It increases the acid production in the stomach and improves liver functions to secrete more bile salts. Therefore, it helps in overall digestion of carbohydrates, proteins and fats. Therefore, it is beneficial in loss of appetite and indigestion. Hingu has carminative, anti-flatulent and antispasmodic properties, which helps in reducing gas, flatulence, bloating and abdominal distension. However, Hing is not a good medicine for ulcer. Its wrong dosage can result in severe ulceration. It works when you have white tongue in the morning and indigestion. You cannot take it alone because it would not help. For speed up healing process of ulcer, you also require using Mulethi powder and AMLA (Indian gooseberry) powder with Hing Powder. Hing is a good home remedy for irritable bowel syndrome. It improves digestion due to its digestive stimulant property. It reduces abdominal cramps and pain due to its antispasmodic property. It also reduces flatulence, bloating and loose stools. It is highly beneficial in people having symptom of mucus in the stool. Hing has analgesic, anti-inflammatory and soothing action in rheumatoid arthritis. According to ayurvedic principles, it has hot potency and it reduces AMA toxins, which are responsible for rheumatoid arthritis. The visible effects appear using it for 15 days. Swelling and pain alleviate. We can notice significant improvement in joint movement and reduction in joint inflammation after using it. Indigestion, bloating, flatulence and heartburn are some common signs, which you may experience after eating a heavy meal or when you overeat. Adding Hing tempering to your food preparations may help you in relieving such gastrointestinal issues. It supports the process of digestion by strengthening the salivary flow and gastric juice secretion. Hing enhances the release of digestive enzymes that help in the proper digestion of food. Improper digestion of food may lead to diarrhea or constipation, gas formation, belching and even bad breath. It further helps in the digestion of fat by enhancing the activity of pancreatic enzymes involved in fat digestion. It also stimulates bile flow and boosts bile acid secretion, which help in proper digestion of foods containing fat. Eating food preparations containing Hing help the muscles of the stomach to relax and prevent stomach cramps and pain. Poor dental health and oral hygiene gives rise to a number of health issues. It is very well-known that disease prevention begins in the mouth, therefore it is important to keep your oral cavity clean and healthy and one such food ingredient, which will help you in achieving this is ‘Hing’. Hing reduces the activity of bacteria that causes tooth decay. It is an amazing and an inexpensive remedy for toothaches too. Hing stimulates the flow of saliva, which helps in clearing out the food particles. It further neutralizes the dental plaque acids and reduces the incidence of dental caries. Hing is an excellent remedy for whooping cough, asthma and bronchitis. It is a natural expectorant that helps in the eradication of excess mucus and relieves chest congestion and cough. Hing helps in expelling the parasitic worms out of the body. The anthelmintic activity of Hing is comparable with that of standard drugs. The dosage of Hing (Hingu) varies from 10 mg to 500 mg.
Hing can be taken twice a day in dosage given above. However, the maximum dosage should not exceed 125 mg per day for people with Pitta Body Type. People with Vata Body type may tolerate 500 mg of Hing per day when taken along with ghee. People with Kapha Body Type may tolerate its dosage up to 2000 mg per day. If you are not sure about your body type and your tolerability, then you should not take Hing more than 250 mg per day. The high dosage should be taken with caution and under the supervision of an ayurvedic physician. Take 300 ml water and add 50 mg Hing Powder. Boil the water and strain it. Consume this water in three divided dosages i.e. about 100 ml per dosage. Some articles on the internet have written dosage of Hing up to 7500 mg, which is the wrong dosage and potentially very harmful. This dosage can severely harm the gastrointestinal tract and cause a severe headache. Hing is LIKELY SAFE in lower amount and amounts found in the foods. The side effects of Hing are heartburn, hyperacidity, diarrhea and headache. In larger amounts, it can have following side effects in some people. According to ayurveda, Hing has very hot potency, which means it produces heat inside the body after its consumption. It can cause side effects in people sensitive to heat or having symptoms or history of gastritis, burning, heat sensation or bleeding disorders. Hing can cause uterine contractions and lead to miscarriage. Therefore, we consider it UNSAFE in Pregnancy. The FERULIC ACID and other chemicals present in Heeng can pass into the breast milk. It has very hot in nature, so it can also lead to bleeding disorders in infants. Therefore, we consider Hingu UNSAFE in Breastfeeding. You should not use Hing in children under age of 5 years. However, it may be safe in food amounts or amount less than 5 mg per day. Heeng can increase the chances of bleeding due to its hot potency. Therefore, you should avoid using it if you are suffering with any type of bleeding disorder. However, lower dosages are used in the treatment of convulsions and epilepsy. Mostly its external application is used for this purpose. It can harm in larger dosage in these diseases. Hingu may increase the chances of bleeding or slow blood clotting process. You should stop taking it at least 14 days before surgery. Hingu can interact with following medicines.